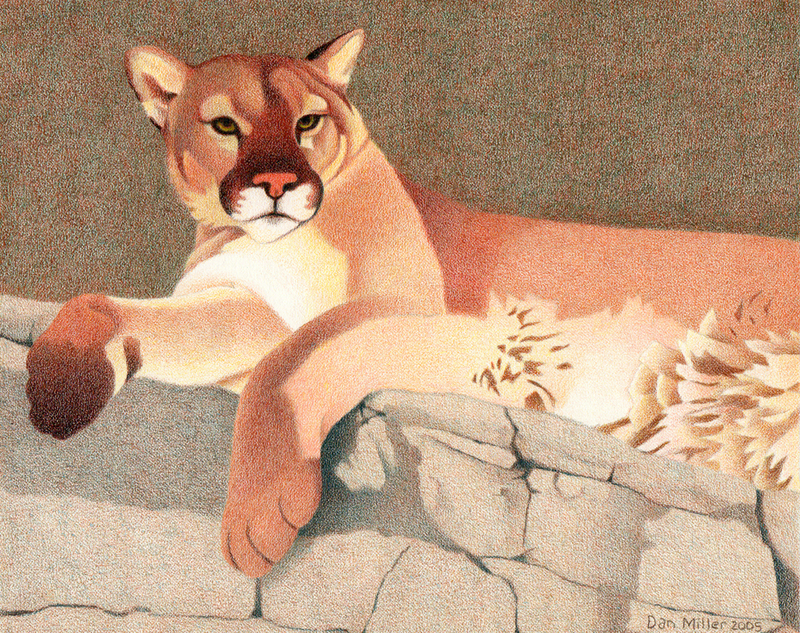 Reclining lazily on a rock ledge, a contented Mountain Lion basks in the warm summer sun. It's interesting how much it resembles, in both pose and manner, a domestic house cat. But don't let its graceful nature fool you, this long, sleek feline is a fearsome hunter. The Cougar is probably the most dominant predator prowling the Colorado Rockies. It inhabits the Montane Zone staying close to its favorite food source, the Mule Deer. This king of the mountain beasts is beautifully robed in golden ochres and warm brown tones with a bleached underside. The face is remarkable, featuring various colors including a pink nose and vivid, green eyes. Dark black trims the muzzle and the always expressive ears. The black tipped tail is outrageously long and the paws are huge. I've never been lucky enough to catch a glimpse of one of these elusive cats in the wild but I know they're around. Wherever there is an abundant supply of deer, a Mountain Lion is sure to follow. When I'm out on the trails before sunrise it's a little scary knowing that a lion could be lurking in the shadows or waiting in ambush. I believe the Mountain Lion is naturally reclusive but as human development continues to expand into their territory, encounters are certain to become more common. Dan, I'm curious to know how large your colored pencil piece is. You've got incredible detail in there. Very impressive. We are staying in Mountain Lion country this week, in the mountains of Southern California. I lived there for 11 years and never saw one! But the evidence is everywhere. They are all around us. Thank you for sharing your art and your thoughts. This drawing is small, it is only 8" x 10". It took a while to finish because I like building up multiple layers of color. For reference I used sketches and a photo I shot at the Denver Zoo. It's interesting to watch the Big Cats because their gestures, attitude and personalities are so much like a domestic cat. Maybe someday I'll actually see one in the wild. I'm currently working on a drawing of a Red Fox and I have plans to start on a watercolor painting of a mountain thunderstorm landscape.